Gallery Paid Support - Gallery developers that have extensive experience installing, working with, and troubleshooting Gallery, will install Gallery for you or try and fix something that's broken. Note that we don't offer any other services besides these two because our developers have a lot to do! Services for Gallery in the SourceForge Marketplace - Gallery is a featured project in the SourceForge Marketplace, where anyone with a SourceForge account can post services that they offer. Current offerings range from installation and upgrades, to integration with third party products and customizations. Keep in mind that most of the listings here are not from people officially associated with Gallery, but they do have more time on their hands than we do so they can help out with more time consuming things. So if you're looking for more help than our free options, check these out! The folks behind the ApertureToGallery plug-in are about to release the next generation export to Gallery tools for Mac OS X; but before they do, they’d like your help. Starting today, Ubermind is beta testing their new Gallery Export plug-ins, and you're all invited to join in. The new plug-ins (available for Aperture 1.5 and 2, and iPhoto '08), are updated and rebranded versions of ApertureToGallery, with tons of new features and enhancements thrown into the mix. Registration takes seconds, so if you’re interested sign up now! The Gallery team is proud to announce the students that have been selected to participate in the 2008 Google Summer of Code. We are very pleased by the quality of the applications for the selected projects, and are really looking forward to working with these students over the summer. Thank you to all the students who sent proposals, and all the mentors who volunteered to participate! Vulnerabilities in web applications (like Gallery) are increasingly a sweet spot for attackers. We are very aware of this, and take the security of the Gallery project very seriously. In addition to our internal guidelines, processes and audits, we’ve had external security experts perform security audits of our code for the last several releases of Gallery 2. Recently, we retained Gotham Digital Science (GDS) to perform security audits on Gallery 1 and 2. They are experts in application security, as it's basically all they do. The relationship we have built with GDS has proven valuable based on the results of the audits and we are looking forward to partnering with them on audits of future versions of Gallery. Please read on! We're excited to be included in this year's Season of Usability. This program pairs up someone from Gallery and a usability expert to guide a student (YOU!) in a usability related project for Gallery. We've come up with a pretty neat project idea: Redesigning our image upload tools, so check out the details and send in your application no later than April 17th. For your ~15 hours a week for 3 months, you'll receive a $1000 stipend and valuable experience working with usability and Open Source! Interested in trying out Gallery on the most recent version of Microsoft's Server operating system? 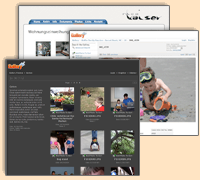 SpikeSource has just released a free WISP (Windows, IIS, SQL Server, PHP) stack with Gallery 2. The stack works on the latest Windows Server 2008, IIS 7 (with PHP FastCGI), and SQL Server 2005. The stack comes with updates and add-on installations through a free trial of their SpikeNet update service. 4 other applications are already available as add-ons. The only prerequisites for the stack are Windows Server 2008 Standard/Enterprise and SQL Server 2005 with mixed-mode authentication. The installer should take care of the rest! Register to download your copy here.